Unfortunately, Advantix for Dogs is not available anymore. Please have a look at our entire Fleas and Ticks range for suitable alternatives. 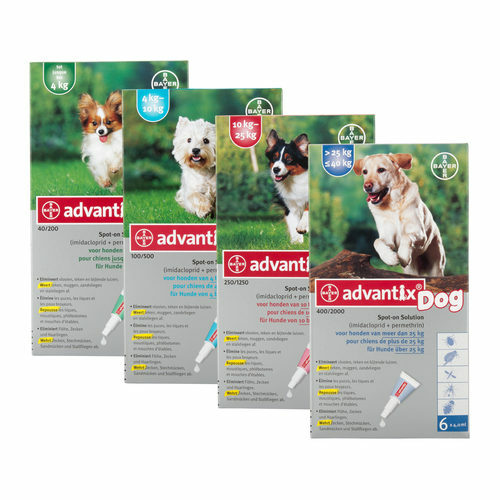 Advantix is a spot-on flea and tick treatment for dogs that is supplied in pipettes. Advantix has a dual effect: it kills flea larvae, fleas and ticks and also acts as a repellent against ticks, mosquitoes, sand flies and stable flies. These parasites can transmit various diseases to your dog, but the repellent activity of Advantix helps to prevent this. Advantix protects against flea infestation for 4 weeks, and takes 3 to 4 weeks to work as a defence and protection measure against other parasites. Any ticks already present on the dog must be removed O'Tom Tick hook. Advantix remains active after exposure to water, although it is best not to wash the dog immediately after application. Advantix is intended for use on the skin, and only on skin that is undamaged. Remove one pipette from the package. Hold pipette in an upright position and twist the pull off cap. Twist in reverse to break the seal and remove the cap. Dog fleas are killed within one day of treatment. A single treatment of Advantix prevents further flea infestation for up to 4 weeks. Advantix can also be used as part of a treatment programme for flea allergy dermatitis. (FAD). We recommend that you also treat your home environment in order to prevent flea reinfestation. This can be done with a room spray such as Indoor-X Pesticide spray. Have you used Advantix before? Let us know what you think about this product.